This is a simple and easy salad with a really big impact in terms of flavor. The rich, caramelized mushrooms in both their simple sautéed form and inside of the arancini create a meatiness that contrasts really well with the freshness of the baby spinach and simple lemon juice dressing. The arancini adds great texture, acting almost as a warm crouton on the outside and a creamy, cheese-y bite on the inside. This serves either as a lovely light entrée or an excellent starter salad. By increasing or decreasing the size of the arancini, you can make this more or less filling. This makes an excellent weeknight meal because it comes together so quickly and uses up leftovers. Place bread crumbs in a shallow bowl and season with salt and pepper. Using your hands, combine risotto and the egg. Season risotto mixture with salt and pepper. Take about 1/2 cup of risotto mixture and form into a patty with your hands. Place mozzarella slice on the patty and press into patty. 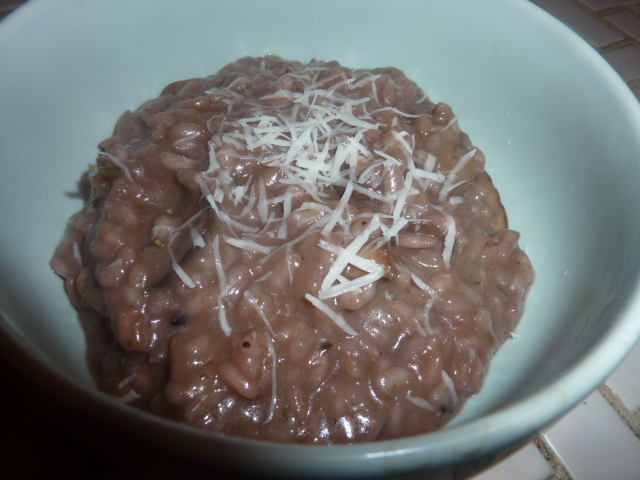 Top with another 1/4 cup or so of risotto mixture. Coat evenly with bread crumbs. Repeat one time with remaining risotto, cheese, and bread crumbs. In a frying pan, heat canola oil over medium-high heat. Meanwhile, in a large sauté pan, heat olive oil over medium heat. Add mushrooms to olive oil and season with salt and pepper. Sauté, stirring frequently, until golden brown, for about 8-10 minutes. As onions are cooking, add risotto patties to the frying pan with canola oil. Cook 5-7 minutes per side until deep golden brown and heated through. As mushrooms and risotto patties are cooking, place spinach greens in a bowl. 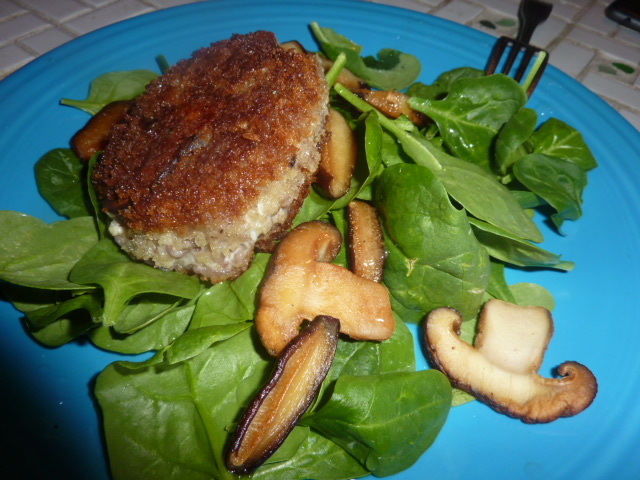 Top spinach greens with mushrooms and then arancini. Top with lemon juice and serve immediately. It’s been way, way too long since I’ve posted. First it was finals, then a new kitten (check after the jump for super adorable kitten pics) and the holidays and moot court brief writing, then we went on our belated honeymoon to Toronto, then it was a mad rush to finish our brief, and then classes started and I went back to work and we started oral argument practice for moot court … basically, life happened. And unlike my usual “life happened” scenario, this one did not involve cooking. Zak took the reins in the kitchen because I was often home late or eating at one of the few options around school as my teammates and I were locked in the moot court room brief writing until midnight or later (basically, a lot of Subway and a couple times of treating ourselves to pizza and salad or burgers when the thought of another six inch sub made us want to cry). I actually made this a week or so ago, because risotto is perfect to make when you want something mindless but wonderfully satisfying. I stood by the stove, reading other competitor’s briefs and stirring, stirring, stirring until the risotto was as creamy as could be, then added some mushrooms and … yum. A nice bowl of simple comfort food, with a hint of red wine flavor lurking behind the umami of the mushrooms and herbiness of tarragon and rosemary. Normally, I am not quite as fastidious about stirring when I make risotto as I was this time, and in retrospect I regret it. This was absolutely divine because it was super, super creamy. Since I have no shame, I will admit to you that I actually licked my bowl. In a medium sauce pan, combine red wine, tarragon, rosemary, garlic, salt, and pepper. Bring to a boil and boil for 2-3 minutes. Reduce heat to a simmer. Heat olive oil in a large sauté pan over medium heat. Once shimmering, add arborio rice. Cook, stirring frequently, until rice is opaque. Reduce heat to low. 1/4 to 1/2 cup at a time, add in red wine and herb mixture. Stir continuously with a wooden spoon until liquid is nearly absorbed. Repeat, stirring continuously or very frequently, for about 30-45 minutes, until rice is creamy and nearly cooked through. In a medium sauté pan, add butter. Melt over medium heat. Add mushrooms and season with salt and pepper. Cook, stirring occasionally, until golden brown. Pour, with any excess liquid, into the risotto. Stir to combine, and continue cooking risotto by adding liquid and stirring, until rice is cooked through. Serve topped with freshly grated Parmesan cheese.